October 9-15, 2016, cyclists will experience a week of unforgettable scenery, cycling and camaraderie as the Tour des Trees rolls through the Piedmont region of North and South Carolina, starting and ending in Charlotte, NC. Tree plantings and community engagement are hallmarks of every Tour, and Professor Elwood Pricklethorn (aka Toronto arborist and veteran Tour cyclist Warren Hoselton) provides educational programs for young audiences along the way. The Tour also adds new trees to the growing urban forest planted by its cyclists. 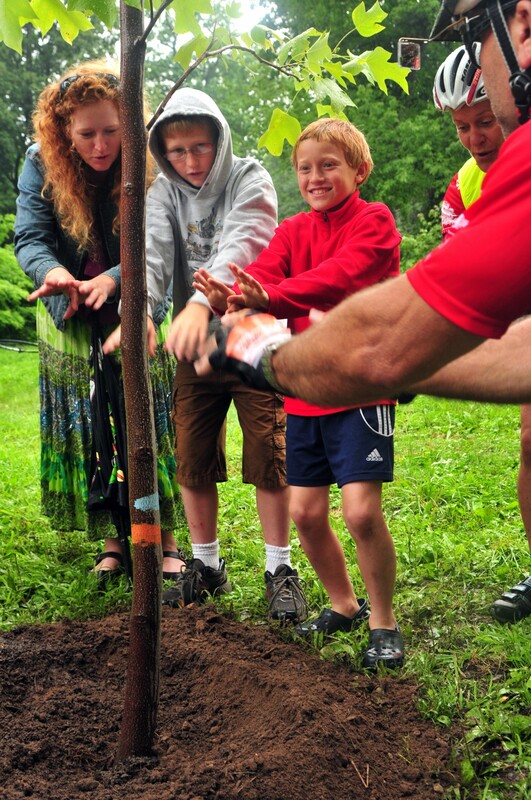 Since 1992, the Tour des Trees has grown to become the largest fundraiser for tree research and education in the world. In 2015, it generated over $340,000 that will be used to support a variety of research projects and educational programs for budding tree care professionals. Four years ago, I embarked upon my first journey with the Stihl Tour des Trees to benefit the TREE (Tree Research and Education Endowment) Fund. I could not have known how much of an impact that one week would have on my life. I remember how hard that first tour was—I never knew my knees could hurt that bad from just pedaling a bicycle. I am happy to say that through three bike tours, my fellow bike riders became among my dearest friends. We have encouraged and learned from each other. The biggest lesson I have learned is that it’s okay to ask for help—and sometimes the nicest people will come along and help you without you even asking. That’s what the TREE Fund is, a place where the scientists of the world can come to ask for help for their arboriculture research. Dr. Mohammad Asrafur Rahman of the Technical University of Munich, Germany is one of those scientists. I will probably never meet him in person but my sponsors helped him with funding his research on “Quantifying the cooling effectiveness of urban street trees in relation to their growth.” Or Dr. Henrik Sjöman at the Swedish University of Agricultural Science/Gothenburg Botanic Garden who is researching “The role of tree species in cooling the urban climate—application in tree planting and landscape architecture.” Once again, the possibility of meeting this individual is slim but we have supported his research that contributes to making our cities more livable. Why else do I ride? For the personal growth, both mental and physical. I have not found a better venue that makes me stronger in so many ways. I learn so much from my fellow riders, support crew, and guest speakers. Many of us are taking vacation time to put our bodies through the challenges put forth by the planners of the ride, but we are still talking trees and learning every day. When you are a tree person you just can’t turn it off! I have had the privilege to talk to individuals that do many different jobs within the industry and learn from each and every one of them. The most important reason I ride, though, remains the same as it did from four years ago—it’s for my boys. They play every sport possible and push themselves relentlessly, and yet they find the energy to be on the honor roll and help me restore our cider mill. They inspire me with their passion, dedication, and their big hearts. On days that everything is overwhelming, all I have to do is think of them and try to emulate them. This goes not only while raising money for the TREE Fund or training or pedaling during the Tour, but in everyday events. Over the past four years, my NY team has raised $14,000 for the TREE Fund. Thank you to everyone who has donated over the years and those who have donated this year for the first time. At the recent annual ReLeaf conference, my NY team together raised $243; this helps immensely and it made the conference extra special for me. Knowing my friends believe that I can pedal for a whole week and that together we are supporting the TREE Fund is an immeasurable boost. If you have not donated this year please consider it, as every dollar goes directly to the Fund to support research and education over the world. Thanks to the commercial sponsors of the bike ride, none of your money goes to support the ride; I am very thankful for them and all they provide so our money can go directly to the cause. We don’t ride for the trees of yesterday, today or tomorrow; we ride so our children will have a world filled with trees. If you can, please spare a few dollars and help support me and the TREE Fund. I am very close to the goal of raising $3500; I am only $300 short, with a month to raise it. Please help me make a difference by donating so together we can change the world one pedal and one tree at a time. Thank you very much. NYSDEC Urban Forestry Intern Jennifer Kotary: Get to Know Her!